On Friday, the U.S. Navy officially announced another episode of its planned “freedom of navigation” series in the South China Sea, shortly after U.S. President Barack Obama met with Chinese President Xi Jinping at a nuclear summit in Washington. The timing of the announcement is curious – coming one day after Xi warned Obama that China would not accept any act violating its sovereignty in the disguise of freedom of navigation, according to China’s state-owned Xinhua News Agency. The U.S. Navy’s next freedom of navigation exercise is planned for early this month, and will likely involve a ship traversing inside a 12 nautical mile limit around a disputed island. As China has increasingly asserted its authority over several of the disputed islands in the South China Sea in recent months, Washington is reacting by ordering more “freedom of navigation” exercises, sailing or flying over near disputed islands to demonstrate its right (and others’) to navigate the seas and airspace. The United States has patrolled these waters for decades, spending a combined 700 days in 2015 in the South China Sea with ships of the Pacific Fleet. In recent months, tensions have risen as U.S. ships have stepped up freedom of navigation exercises, which were initiated in October 2015. 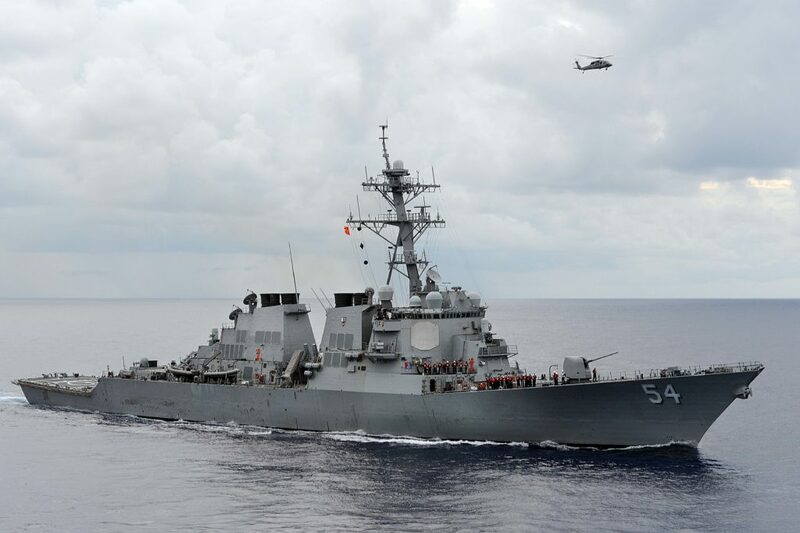 U.S. ships are routinely shadowed by Chinese ships, and communications have been tense. Last October, the USS Lassen, a destroyer, conducted a freedom of navigation patrol within the 12 nautical mile limit of Subi Reef, one of seven artificial islands built by China in the Spratly Island chain. And on January 30, the destroyer USS Curtis Wilbur conducted a similar patrol around Triton Island, which is a part of the Paracel Islands archipelago that is claimed by Beijing. Most recently, the U.S. sailed an aircraft carrier, two destroyers, two cruisers, and the command ship of the Japan-based 7th Fleet into disputed waters in March, following the Chinese deployment of surface-to-air missiles on Woody Island in the Paracel Islands. The site chosen for the next freedom of navigation exercise might be Mischief Reef (previously submerged at high tide), located well within the 200 nautical mile exclusive economic zone (EEZ) extending from the Philippine island of Palawan. The reef is currently occupied and controlled by China, despite rival claims by Taiwan, the Philippines, and Vietnam. In 2014, China commenced a dredging project to turn the reef into an island, hoping it would then generate a territorial claim on surrounding waters. Since January, huge quantities of sand have been dredged by Chinese boats from around Mischief Reef to create a more substantial land mass. The reef is now home to an airstrip capable of supporting military aircraft. The announcement of a new freedom of navigation exercise immediately following the meeting between Obama and Xi would seem to imply some serious differences – and where better to hold it than in the disputed waters of a treaty ally? Washington may be wanting to show its pledged support to Manila, especially after the Philippine government granted U.S. troops the use of five Philippine military bases in March, including Antonio Bautista Air Base on Palawan island, not far from Mischief Reef. Washington and Beijing are at significant odds over the South China Sea. It now appears every aggressive action or stance taken by Beijing will be countered in some measure by an immediate reaction from Washington.